All Starbucks cafes in Japan serve soymilk, and since giving up coffee I especially like Matcha (Japanese green tea) tea lattes. The nice thing about Japan is that they give you a "soy" card at the when you pay for the drink, and then you hand this to the barrister upon collecting it. 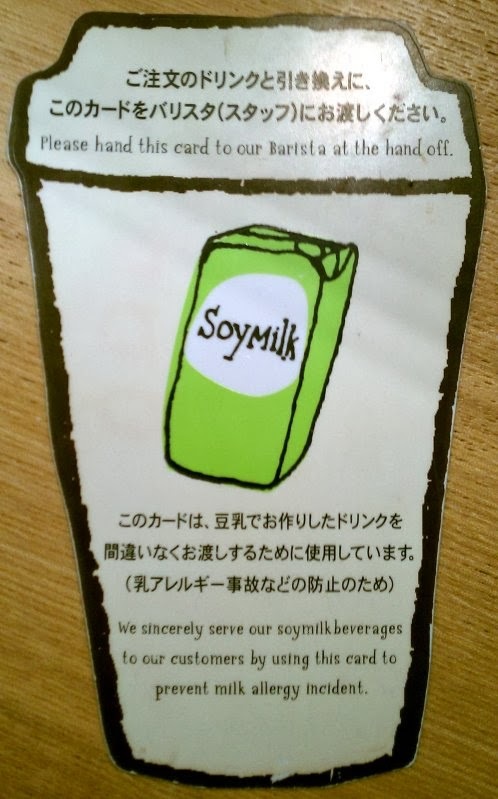 This card is given at the counter and returned upon receiving the drink - a sure way to know that you're soy drink really is. Tulley's have recently introduced one. This prevents "milk allergy incidents" (and gut-wrenching surprises for vegans) caused by miscommunication or staff forgetting the soy order, which I've experienced in both Taiwan and Korea. Starbucks also have the added benefit of being non-smoking, as most cafes in Japan have 'smoking sections' but the smoke doesn't seem to understand its restriction to one part of the cafeteria. 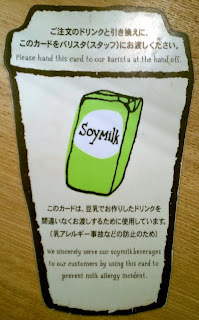 The 'Soymilk' sticker is an added security, as is the 'S' (for soymilk). The GTL = Green Tea Latte, my favourite drink since giving up coffee. Starbucks also offer free wifi, but with a catch: you need to register first, and you need internet to register! It's a strange system (which seems surprisingly illogical for Japan) but I guess it's to offer the service to regular patrons (at the expense of travelers who often need it most). If you have a smartphone, you can use it to register, but then you probably don't need it as much . Therefore, it's best to set up a (free) account here (from your home or hotel) first. I recently discovered that Tulleys Coffee cafes also serve soymilk, and do a good Matcha Tea Latte (similar to Starbucks's). They also recently introduced a 'Soy' card, like that at Starbucks. I find their cafes are often more pleasant than Starbucks, and it's often easier to find a seat in one. Even when full (as most cafes in Tokyo seem to be most of the time) I still find them less crowded. 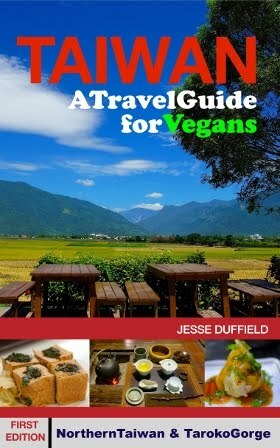 I am not aware of any coffee shops (other than perhaps some small macrobiotic restaurants) which serve any vegan food, except possibly some potato chips or similar. Starbucks have the courtesy to label common allergens, but as of July 2013 none are free of dairy and egg. I miss the blueberry bagel from Starbucks in Taiwan.